Belgrade (/ˈbɛlɡreɪd/ BEL-grayd; Serbian: Beograd / Београд, meaning 'white city', Serbian pronunciation: [beǒɡrad] ( listen); names in other languages) is the capital and largest city of Serbia. It is located at the confluence of the Sava and Danube rivers and the crossroads of the Pannonian Plain and the Balkan Peninsula. The urban area of the City of Belgrade has a population of 1.23 million, while nearly 1.7 million people live within its administrative limits. One of the most important prehistoric cultures of Europe, the Vinča culture, evolved within the Belgrade area in the 6th millennium BC. In antiquity, Thraco–Dacians inhabited the region and, after 279 BC, Celts settled the city, naming it Singidūn. It was conquered by the Romans under the reign of Augustus and awarded Roman city rights in the mid-2nd century. It was settled by the Slavs in the 520s, and changed hands several times between the Byzantine Empire, the Frankish Empire, the Bulgarian Empire and the Kingdom of Hungary before it became the seat of the Serbian king Stefan Dragutin (ruled 1282–1316). In 1521, Belgrade was conquered by the Ottoman Empire and became the seat of the Sanjak of Smederevo. It frequently passed from Ottoman to Habsburg rule, which saw the destruction of most of the city during the Austro-Ottoman wars. Belgrade was again named the capital of Serbia in 1841. Northern Belgrade remained the southernmost Habsburg post until 1918, when the city was reunited. In a fatally strategic position, the city was battled over in 115 wars and razed 44 times. 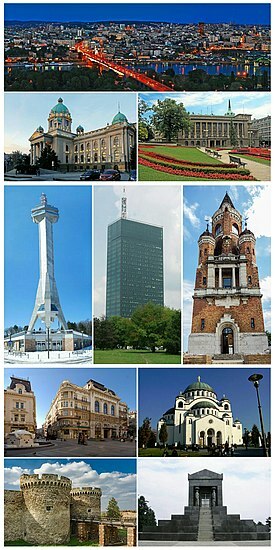 Belgrade was the capital of Yugoslavia from its creation in 1918 to its dissolution in 2006. Belgrade has special administrative status within Serbia and is one of the five statistical regions that make up the country. Its metropolitan territory is divided into 17 municipalities, each with its own local council. The city of Belgrade covers 3.6% of Serbia's territory, and around 24% of the country's population lives within its administrative limits. It is classified as a Beta-Global City. Chipped stone tools found in Zemun show that the area around Belgrade was inhabited by nomadic foragers in the Palaeolithic and Mesolithic eras. Some of these tools are of Mousterian industry—belonging to Neanderthals rather than modern humans. Aurignacian and Gravettian tools have also been discovered near the area, indicating some settlement between 50,000 and 20,000 years ago. The first farming people to settle in the region are associated with the Neolithic Starčevo culture, which flourished between 6200 and 5200 BC. There are several Starčevo sites in and around Belgrade, including the eponymous site of Starčevo. The Starčevo culture was succeeded by the Vinča culture (5500–4500 BC), a more sophisticated farming culture that grew out of the earlier Starčevo settlements and also named for a site in the Belgrade region (Vinča-Belo Brdo). The Vinča culture is known for its very large settlements, one of the earliest settlements by continuous habitation and some of the largest in prehistoric Europe. Also associated with the Vinča culture are anthropomorphic figurines such as the Lady of Vinča, the earliest known copper metallurgy in Europe, and a proto-writing form developed prior to the Sumerians and Minoans known as the Old European script, which dates back to around 5300 BC. Within the city proper, on Cetinjska Street, a skull of a Paleolithic human was discovered in 1890. The skull is dated to before 5000 BC. Evidence of early knowledge about Belgrade's geographical location comes from a variety of ancient myths and legends. The ridge overlooking the confluence of the Sava and Danube rivers, for example, has been identified as one of the places in the story of Jason and the Argonauts. In the time of antiquity, too, the area was populated by Paleo-Balkan tribes, including the Thracians and the Dacians, who ruled much of Belgrade's surroundings. Specifically, Belgrade was at one point inhabited by the Thraco-Dacian tribe Singi; following Celtic invasion in 279 BC, the Scordisci wrested the city from their hands, naming it Singidūn (dūn, fortress). In 34–33 BC, the Roman army, led by Silanus, reached Belgrade. It became the romanised Singidunum in the 1st century AD and, by the mid-2nd century, the city was proclaimed a municipium by the Roman authorities, evolving into a full-fledged colonia (the highest city class) by the end of the century. While the first Christian Emperor of Rome —Constantine I, also known as Constantine the Great—was born in the territory of Naissus to the city's south, Roman Christianity's champion, Flavius Iovianus (Jovian), was born in Singidunum. Jovian reestablished Christianity as the official religion of the Roman Empire, ending the brief revival of traditional Roman religions under his predecessor Julian the Apostate. In 395 AD, the site passed to the Eastern Roman or Byzantine Empire. Across the Sava from Singidunum was the Celtic city of Taurunum (Zemun); the two were connected with a bridge throughout Roman and Byzantine times. In 442, the area was ravaged by Attila the Hun. In 471, it was taken by Theodoric the Great, king of the Ostrogoths, who continued into Italy. As the Ostrogoths left, another Germanic tribe, the Gepids, invaded the city. In 539 it was retaken by the Byzantines. In 577, some 100,000 Slavs poured into Thrace and Illyricum, pillaging cities and more permanently settling the region. The Avars, under Bayan I, conquered the whole region and its new Slavic population by 582. Following Byzantine reconquest, the Byzantine chronicle De Administrando Imperio mentions the White Serbs, who had stopped in Belgrade on their way back home, asking the strategos for lands; they received provinces in the west, towards the Adriatic, which they would rule as subjects to Heraclius (610–641). In 829, Khan Omurtag was able to add Singidunum and its environs to the First Bulgarian Empire. The first record of the name Belograd appeared on April, 16th, 878, in a Papal missive to Bulgarian ruler Boris I. This name would appear in several variants: Alba Bulgarica in Latin, Griechisch Weissenburg in High German, Nándorfehérvár in Hungarian, and Castelbianco in Venetian, among other names, all variations of 'white fortress'. For about four centuries, the city would become a battleground between the Byzantine Empire, the medieval Kingdom of Hungary, and the Bulgarian Empire. Basil II (976–1025) installed a garrison in Belgrade. The city hosted the armies of the First and the Second Crusade, but, while passing through during the Third Crusade, Frederick Barbarossa and his 190,000 crusaders saw Belgrade in ruins. King Stefan Dragutin (r. 1276–1282) received Belgrade from his father-in-law, Stephen V of Hungary, in 1284, and it served as the capital of the Kingdom of Syrmia, a vassal state to the Kingdom of Hungary. Dragutin (Hungarian: Dragutin István) is regarded as the first Serbian king to rule over Belgrade. Following the battles of Maritsa (1371) and Kosovo field (1389), Moravian Serbia, to Belgrade's south, began to fall to the Ottoman Empire. The northern sections of what is now Serbia persisted as the Serbian Despotate, with Belgrade as its capital. The city flourished under Stefan Lazarević, the son of Serbian prince Lazar Hrebeljanović. Lazarević built a castle with a citadel and towers, of which only the Despot's tower and the west wall remain. He also refortified the city's ancient walls, allowing the Despotate to resist Ottoman conquest for almost 70 years. During this time, Belgrade was a haven for many Balkan peoples fleeing Ottoman rule, and is thought to have had a population ranging between 40,000 to 50,000 people. In 1427, Stefan's successor Đurađ Branković, returning Belgrade to the Hungarian king, made Smederevo his new capital. Even though the Ottomans had captured most of the Serbian Despotate, Belgrade, known as Nándorfehérvár in Hungarian, was unsuccessfully besieged in 1440 and 1456. As the city presented an obstacle to the Ottoman advance into Hungary and further, over 100,000 Ottoman soldiers besieged it in 1456, in which the Christian army led by the Hungarian General John Hunyadi successfully defended it. The noon bell ordered by Pope Callixtus III commemorates the victory throughout the Christian world to this day. Seven decades after the initial siege, on 28 August 1521, the fort was finally captured by Suleiman the Magnificent, 250,000 Turkish soldiers, and over 100 ships. Subsequently, most of the city was razed to the ground and its entire Orthodox Christian population was deported to Istanbul to an area that has since become known as the Belgrade forest. Belgrade was made the seat of the Pashalik of Belgrade (also known as the Sanjak of Smederevo), and quickly became the second largest Ottoman town in Europe at over 100,000 people, surpassed only by Constantinople. Ottoman rule introduced Ottoman architecture, including numerous mosques, and the city was resurrected—now by Oriental influences. In 1594, a major Serb rebellion was crushed by the Ottomans. Later, Grand Vizier Sinan Pasha ordered the relics of Saint Sava to be publicly torched on the Vračar plateau; in the 20th century, the Temple of Saint Sava was built to commemorate this event. Occupied by the Habsburgs three times (1688–1690, 1717–1739, 1789–1791), headed by the Holy Roman Princes Maximilian of Bavaria and Eugene of Savoy, and field marshal Baron Ernst Gideon von Laudon, respectively, Belgrade was quickly recaptured by the Ottomans and substantially razed each time. During this period, the city was affected by the two Great Serbian Migrations, in which hundreds of thousands of Serbs, led by two Serbian Patriarchs, retreated together with the Austrian soldiers into the Habsburg Empire, settling in today's Vojvodina and Slavonia. At the beginning of the 19th century, Belgrade was predominantly inhabited by a Muslim population. Traces of Ottoman rule and architecture—such as mosques and bazaars, were to remain a prominent part of Belgrade's townscape into the 19th century; several decades, even, after Serbia was granted autonomy from the Ottoman Empire. During the First Serbian Uprising, Serbian revolutionaries held the city from 8 January 1807 until 1813, when it was retaken by the Ottomans. After the Second Serbian Uprising in 1815, Serbia achieved some sort of sovereignty, which was formally recognised by the Porte in 1830. The development of Belgrade architecture after 1815 can be divided into four periods. In the first phase, which lasted from 1815 to 1835, the dominant architectural style was still of a Balkan character, with substantial Ottoman influence. At the same time, an interest in joining the European mainstream allowed Central and Western European architecture to flourish. Between 1835 and 1850, the amount of neoclassicist and baroque buildings south of the Austrian border rose considerably, exemplified by St Michael's Cathedral (Serbian: Saborna crkva), completed in 1840. Between 1850 and 1875, new architecture was characterised by a turn towards the newly-popular Romanticism, along with older European architectural styles. Typical of Central European cities in the last quarter of the 19th century, the fourth phase was characterised by an eclecticist style based on the Renaissance and Baroque periods. In 1841, Prince Mihailo Obrenović moved the capital of the Principality of Serbia from Kragujevac to Belgrade. During his first reign (1815–1839), Prince Miloš Obrenović pursued expansion of the city’s population through the addition of new settlements, aiming and succeeding to make Belgrade the centre of the Principality’s administrative, military and cultural institutions. His project of creating a new market space (the Abadžijska čaršija), however, was less successful; trade continued to be conducted in the centuries-old Donja čaršija and Gornja čaršija. Still, new construction projects were typical for the Christian quarters as the older Muslim quarters declined; from Serbia's autonomy until 1863, the number of Belgrade quarters even decreased, mainly as a consequence of the gradual disappearance of the city's Muslim population. An Ottoman city map from 1863 counts only 9 Muslim quarters (mahalas). The names of only five such neighbourhoods are known today: Ali-pašina, Reis-efendijina, Jahja-pašina, Bajram-begova and Laz Hadži-Mahmudova. On 18 April 1867, the Ottoman government ordered the Ottoman garrison, which had been since 1826 the last representation of Ottoman suzerainty in Serbia, withdrawn from Kalemegdan. The forlorn Porte's only stipulation was that the Ottoman flag continue to fly over the fortress alongside the Serbian one. Serbia's de facto independence dates from this event. In the following years, urban planner Emilijan Josimović had a significant impact on Belgrade. He conceptualised a regulation plan for the city in 1867, in which he proposed the replacement of the town's crooked streets with a grid plan. Of great importance also was the construction of independent Serbian political and cultural institutions, as well as the city's now-plentiful parks. Pointing to Josimović's work, Serbian scholars have noted an important break with Ottoman traditions. However, Istanbul—the capital city of the state to which Belgrade and Serbia de jure still belonged—underwent similar changes. In May 1868, knez Mihailo was assassinated with his cousin Anka Konstantinović while riding in a carriage in his country residence. With the Principality's full independence in 1878 and its transformation into the Kingdom of Serbia in 1882, Belgrade once again became a key city in the Balkans, and developed rapidly. Nevertheless, conditions in Serbia remained those of an overwhelmingly agrarian country, even with the opening of a railway to Niš, Serbia's second city. In 1900, the capital had only 70,000 inhabitants (at the time Serbia numbered 2.5 million). Still, by 1905, the population had grown to more than 80,000 and, by the outbreak of World War I in 1914, it had surpassed the 100,000 citizens, disregarding Zemun, which still belonged to Austria-Hungary. The first-ever projection of motion pictures in the Balkans and Central Europe was held in Belgrade in June 1896 by André Carr, a representative of the Lumière brothers. He shot the first motion pictures of Belgrade in the next year; however, they have not been preserved. The First World War began on 28 July 1914 when Austria-Hungary declared war on Serbia. Most of the subsequent Balkan offensives occurred near Belgrade. Austro-Hungarian monitors shelled Belgrade on 29 July 1914, and it was taken by the Austro-Hungarian Army under General Oskar Potiorek on 30 November. On 15 December, it was re-taken by Serbian troops under Marshal Radomir Putnik. After a prolonged battle which destroyed much of the city, starting on 6 October 1915, Belgrade fell to German and Austro-Hungarian troops commanded by Field Marshal August von Mackensen on 9 October of the same year. The city was liberated by Serbian and French troops on 1 November 1918, under the command of Marshal Louis Franchet d'Espèrey of France and Crown Prince Alexander of Serbia. Belgrade, decimated as a front-line city, lost the title of largest city in the Kingdom to Subotica for some time. King Alexander Bridge was destroyed in 1941 and rebuilt after the end of World War II, 1956, as the single-span Branko's Bridge. After the war, Belgrade became the capital of the new Kingdom of Serbs, Croats and Slovenes, renamed the Kingdom of Yugoslavia in 1929. The Kingdom was split into banovinas and Belgrade, together with Zemun and Pančevo, formed a separate administrative unit. During this period, the city experienced fast growth and significant modernisation. Belgrade's population grew to 239,000 by 1931 (with the inclusion of Zemun), and to 320,000 by 1940. The population growth rate between 1921 and 1948 averaged 4.08% a year. In 1927, Belgrade's first airport opened, and in 1929, its first radio station began broadcasting. The Pančevo Bridge, which crosses the Danube, was opened in 1935, while King Alexander Bridge over the Sava was opened in 1934. On 3 September 1939 the first Belgrade Grand Prix, the last Grand Prix motor racing race before the outbreak of World War II, was held around the Belgrade Fortress and was followed by 80,000 spectators. The winner was Tazio Nuvolari. On 25 March 1941, the government of regent Crown Prince Paul signed the Tripartite Pact, joining the Axis powers in an effort to stay out of the Second World War and keep Yugoslavia neutral during the conflict. This was immediately followed by mass protests in Belgrade and a military coup d'état led by Air Force commander General Dušan Simović, who proclaimed King Peter II to be of age to rule the realm. As a result, the city was heavily bombed by the Luftwaffe on 6 April 1941, killing up to 2,274 people. Yugoslavia was then invaded by German, Italian, Hungarian, and Bulgarian forces. Belgrade was captured by subterfuge, with six German soldiers led by their officer Fritz Klingenberg feigning threatening size, forcing the city to capitulate. Belgrade was more directly occupied by the German Army in the same month and became the seat of the puppet Nedić regime, headed by its namesake general. Just like Rotterdam, which was devastated twice by both German and Allied bombing, Belgrade was bombed once more during World War II, this time by the Allies on 16 April 1944, killing at least 1,100 people. This bombing fell on the Orthodox Christian Easter. Most of the city remained under German occupation until 20 October 1944, when it was liberated by the Red Army and the Communist Yugoslav Partisans. On 29 November 1945, Marshal Josip Broz Tito proclaimed the Federal People's Republic of Yugoslavia in Belgrade (later to be renamed to Socialist Federal Republic of Yugoslavia on 7 April 1963). Higher estimates from the former secret police place the victim count of political persecutions in Belgrade at 10,000. When the war ended, the city was left with 11,500 demolished housing units. During the post-war period, Belgrade grew rapidly as the capital of the renewed Yugoslavia, developing as a major industrial centre. In 1948, construction of New Belgrade started. In 1958, Belgrade's first television station began broadcasting. In 1961, the conference of Non-Aligned Countries was held in Belgrade under Tito's chairmanship. In 1962, Belgrade Nikola Tesla Airport was built. In 1968, major student protests led to several street clashes between students and the police. On 9 March 1991, massive demonstrations led by Vuk Drašković were held in the city against Slobodan Milošević. According to various media outlets, there were between 100,000 and 150,000 people on the streets. Two people were killed, 203 injured and 108 arrested during the protests, and later that day tanks were deployed onto the streets to restore order. Further protests were held in Belgrade from November 1996 to February 1997 against the same government after alleged electoral fraud in local elections. These protests brought Zoran Đinđić to power, the first mayor of Belgrade since World War II who did not belong to the League of Communists of Yugoslavia or its later offshoot, the Socialist Party of Serbia. In 1999, during the Kosovo War, NATO bombings caused damage to the city. Among the sites bombed were various ministry buildings, the RTS building, several hospitals, the Hotel Jugoslavija, the Central Committee building, the Avala Tower, and the Chinese embassy. After the 2000 presidential elections, Belgrade was the site of major public protests, with over half a million people on the streets. These demonstrations resulted in the ousting of president Milošević as a part of the Otpor! movement. In 2014, Belgrade Waterfront, an urban renewal project, was initiated by the Government of Serbia and its Emirati partner, Eagle Hillls Properties. Aimed at improving Belgrade's cityscape and economy, the project hopes to revitalise the Sava amphitheatre, a neglected expanse on the right bank of the Sava river between the Belgrade Fair and th former Belgrade Main railway station. Around €3.5 billion will be jointly invested by the Serbian government and their Emirati partners. The project includes office and luxury apartment buildings, five-star hotels, a shopping mall and the envisioned 'Belgrade Tower'. The project is, however, quite controversial—there are a number of uncertainties regarding its funding, necessity, and its architecture's arguable lack of harmony with the rest of the city. Apart from Belgrade Waterfront, the city is currently under rapid development and reconstruction, especially in the area of Novi Beograd, where many apartment and office buildings are under construction to support the burgeoning IT sector, now one of Serbia's largest economic players. Belgrade lies 116.75 metres (383.0 ft) above sea level and is located at the confluence of the Danube and Sava rivers. The historical core of Belgrade, Kalemegdan, lies on the right banks of both rivers. Since the 19th century, the city has been expanding to the south and east; after World War II, New Belgrade was built on the left bank of the Sava river, connecting Belgrade with Zemun. Smaller, chiefly residential communities across the Danube, like Krnjača, Kotež and Borča, also merged with the city, while Pančevo, a heavily industrialised satellite city, remains a separate town. The city has an urban area of 360 square kilometres (140 sq mi), while together with its metropolitan area it covers 3,223 km2 (1,244 sq mi). On the right bank of the Sava, central Belgrade has a hilly terrain, while the highest point of Belgrade proper is Torlak hill at 303 m (994 ft). 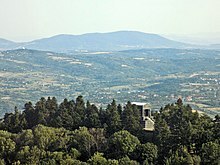 The mountains of Avala (511 m (1,677 ft)) and Kosmaj (628 m (2,060 ft)) lie south of the city. Across the Sava and Danube, the land is mostly flat, consisting of alluvial plains and loessial plateaus. One of the characteristics of the city terrain is mass wasting. On the territory covered by the General Urban Plan there are 1,155 recorded mass wasting points, out of which 602 are active and 248 are labeled as the 'high risk'. They cover almost 30% of the city territory and include several types of mass wasting. Downhill creeps are located on the slopes above the rivers, mostly on the clay or loam soils, inclined between 7 and 20%. Most critical ones are in Karaburma, Zvezdara, Višnjica, Vinča and Ritopek, in the Danube valley, and Umka, and especially its neighbourhood of Duboko, in the Sava valley. They have moving and dormant phases, and some of them have been recorded for centuries. Less active downhill creep areas include the entire Terazije slope above the Sava (Kalemegdan, Savamala), which can be seen by the inclination of the Pobednik monument and the tower of the Cathedral Church, and the Voždovac section, between Banjica and Autokomanda. Landslides encompass smaller areas, develop on the steep cliffs, sometimes being inclined up to 90%. They are mostly located in the artificial loess hills of Zemun: Gardoš, Ćukovac and Kalvarija. However, the majority of the land movement in Belgrade, some 90%, is triggered by the construction works and faulty water supply system (burst pipes, etc.). The neighbourhood of Mirijevo is considered to be the most successful project of fixing the problem. During the construction of the neighbourhood from the 1970s, the terrain was systematically improved and the movement of the land is today completely halted. Belgrade has a humid subtropical climate (Cfa), according to Köppen climate classification, with four seasons and uniformly spread precipitation. Monthly averages range from 1.4 °C (34.5 °F) in January to 23.0 °C (73.4 °F) in July, with an annual mean of 12.5 °C (54.5 °F). There are, on average, 31 days a year when the temperature is above 30 °C (86 °F), and 95 days when the temperature is above 25 °C (77 °F). Belgrade receives about 691 millimetres (27 in) of precipitation a year, with late spring being wettest. The average annual number of sunny hours is 2,112. The highest officially recorded temperature in Belgrade was 43.6 °C (110.5 °F) on 24 July 2007, while on the other end, the lowest temperature was −26.2 °C (−15 °F) on 10 January 1893. The 2014 Belgrade local elections were won by the Serbian Progressive Party, which formed a ruling coalition with the Socialist Party of Serbia. These elections ended the long-time rule of the Democratic Party, which was in power from 2004 to 2013. The city is divided into 17 municipalities. Previously, they were classified into 10 urban (lying completely or partially within borders of the city proper) and 7 suburban municipalities, whose centres are smaller towns. With the new 2010 City statute, they were all given equal status, with the proviso that suburban ones (except Surčin) have certain autonomous powers, chiefly related with construction, infrastructure and public utilities. Most of the municipalities are situated on the southern side of the Danube and Sava rivers, in the Šumadija region. Three municipalities (Zemun, Novi Beograd, and Surčin), are on the northern bank of the Sava in the Syrmia region and the municipality of Palilula, spanning the Danube, is in both the Šumadija and Banat regions. Belgrade is home to many ethnicities from across the former Yugoslavia and the wider Balkans region. The main ethnic groups are: Serbs (1,505,448), Roma (27,325), Montenegrins (9,902), Yugoslavs (8,061), Croats (7,752), Macedonians (6,970), and Muslims by nationality (3,996). Many people came to the city as economic migrants from smaller towns and the countryside, while tens of thousands arrived as refugees from Croatia, Bosnia-Herzegovina and Kosovo, as a result of the Yugoslav wars of the 1990s. Between 10,000 and 20,000 Chinese people are estimated to live in Belgrade and, since their arrival in the mid-1990s, Block 70 in New Belgrade has been known colloquially as the Chinese quarter. Many Middle Easterners, mainly from Syria, Iran, Jordan and Iraq, arrived in order to pursue their studies during the 1970s and 1980s, and have remained in the city. Although there are several historic religious communities in Belgrade, the religious makeup of the city is relatively homogeneous. The Serbian Orthodox community is by far the largest, with 1,475,168 adherents. There are also 31,914 Muslims, 13,720 Roman Catholics, and 3,128 Protestants. There once was a significant Jewish community in Belgrade but, following the World War II Nazi occupation of the city and subsequent Jewish emigration, their numbers have fallen from over 10,000 to just 295. Belgrade is the financial centre of Serbia and Southeast Europe, with a total of 17 million square metres (180 million square feet) of office space. It is also home to the country's Central Bank. Currently, over 600,000 people are employed in 120,286 companies, 60,000 enterprises and 50,000 shops. The City of Belgrade itself owns 267,147 square metres (2,875,550 square feet) of rentable office space. As at 2009, Belgrade contained 31.4% of Serbia's employed population and generated over 38% of its GDP. The City's nominal GDP in 2014 was estimated at 16.97 billion USD, amounting to 859,329 RSD ($10,086) per capita. GDP at purchasing power parity was estimated at $36.1bn USD, which was $31,461 per capita in terms of purchasing power parity. New Belgrade is the country's main business district and one of Southeastern Europe's financial centres. It offers a range of facilities, such as hotels, congress halls (e.g. Sava Centar), Class A and B office buildings, and business parks (e.g. Airport City Belgrade). Over 1.2 million square metres (13 million square feet) of land is currently under construction in New Belgrade, with the value of planned construction over the next three years estimated at over 1.5 billion euros. The Belgrade Stock Exchange is also located in New Belgrade, and has a market capitalisation of €6.5 billion (US$9 billion). With 6,924 companies in the IT sector (according to 2013 data[update]), Belgrade is one of the foremost information technology hubs in Southeast Europe. Microsoft's 'Development Center Serbia', located in Belgrade was, at the time of its establishment, the fifth such programme on the globe. Many global IT companies choose Belgrade as their European or regional centre of operations, such as Asus, Intel, Dell, Huawei, and NCR. The most famous Belgrade IT startups, among others, are Nordeus, ComTrade Group, MicroE, and Endava. IT facilities in the city include the Mihajlo Pupin Institute and the ILR, as well as the brand-new IT Park Zvezdara. Many prominent IT innovators began their careers in Belgrade, including Voja Antonić and Veselin Jevrosimović. In September 2013, the average Belgrade monthly salary stood at 53,564 RSD ($635) in net terms, with the gross equivalent at 73,970 RSD ($877). The 2013 Annual Economist Intelligence Unit Survey ranked Belgrade the 86th most expensive out of 131 world cities. According to the 2015 Survey, 73% of the city's households owned a computer, 65.8% had a broadband internet connection and 73.9% had pay television services. The city was one of the main centres of the Yugoslav new wave in the 1980s: VIS Idoli, Ekatarina Velika, Šarlo Akrobata and Električni Orgazam were all from Belgrade. Other notable Belgrade rock acts include Riblja Čorba, Bajaga i Instruktori and Partibrejkers. Today, it is the centre of the Serbian hip hop scene, with acts such as Beogradski Sindikat, Škabo, Marčelo, and most of the Bassivity Music stable hailing from or living in the city. There are numerous theatres, the most prominent of which are National Theatre, Theatre on Terazije, Yugoslav Drama Theatre, Zvezdara Theatre, and Atelier 212. The Serbian Academy of Sciences and Arts is also based in Belgrade, as well as the National Library of Serbia. Other major libraries include the Belgrade City Library and the Belgrade University Library. Belgrade's two opera houses are: National Theatre and Madlenianum Opera House. There are many foreign cultural institutions in Belgrade, including the Spanish Instituto Cervantes, the German Goethe-Institut and the French Institut français, which are all located in the central pedestrian area of Knez Mihailova Street. Other cultural centres in Belgrade are American Corner, Austrian Cultural Forum, British Council, Chinese Confucius Institute, Canadian Cultural centre, Hellenic Foundation for Culture, Italian Istituto Italiano di Cultura, Iranian Culture centre, Azerbaijani Culture centre and Russian centre for Science and Culture. European Union National Institutes for Culture operates a cluster of cultural centres from the EU. The most prominent museum in Belgrade is the National Museum, founded in 1844 and reconstructed from 2003 till June 2018. The museum houses a collection of more than 400,000 exhibits (over 5600 paintings and 8400 drawings and prints, including many foreign masters like Bosch, Juan de Flandes, Titian, Tintoretto, Rubens, Van Dyck, Cézanne, G.B. Tiepolo, Renoir, Monet, Lautrec, Matisse, Picasso, Gauguin, Chagall, Van Gogh, Mondrian etc.) and also the famous Miroslav's Gospel. The Ethnographic Museum, established in 1901, contains more than 150,000 items showcasing the rural and urban culture of the Balkans, particularly the countries of former Yugoslavia. The Museum of Contemporary Art was the first contemporary art museum in Yugoslavia and, following its foundation in 1965, has amassed a collection of more than 8,000 works from art produced across the former Yugoslavia. The museum was closed in 2007, but has since been reopened in 2017 to focus on the modern as well as on the Yugoslav art scenes. The Military Museum, established in 1878 in Kalemegdan, houses a wide range of more than 25,000 military objects dating from the prehistoric to the mediaeval to the modern eras. Notable items include Turkish and oriental arms, national banners, and Yugoslav Partisan regalia. The Museum of Aviation in Belgrade located near Belgrade Nikola Tesla Airport has more than 200 aircraft, of which about 50 are on display, and a few of which are the only surviving examples of their type, such as the Fiat G.50. This museum also displays parts of shot down US and NATO aircraft, such as the F-117 and F-16. The Nikola Tesla Museum, founded in 1952, preserves the personal items of Nikola Tesla, the inventor after whom the Tesla unit was named. It holds around 160,000 original documents and around 5,700 personal other items including his urn. The last of the major Belgrade museums is the Museum of Vuk and Dositej, which showcases the lives, work and legacy of Vuk Stefanović Karadžić and Dositej Obradović, the 19th century reformer of the Serbian literary language and the first Serbian Minister of Education, respectively. Belgrade also houses the Museum of African Art, founded in 1977, which has a large collection of art from West Africa. The Museum of Yugoslav History has collections from the Yugoslav era. Beside paintings, the most valuable are Moon rocks donated by Apollo 11 crew Neil Armstrong, Buzz Aldrin and Michael Collins while visiting Belgrade in 1969 and from mission Apollo 17 donated by Richard Nixon in 1971. Museum also houses Joseph Stalin's sabre with 260 brilliants and diamonds, donated by Stalin himself. Belgrade has wildly varying architecture, from the centre of Zemun, typical of a Central European town, to the more modern architecture and spacious layout of New Belgrade. The oldest architecture is found in Kalemegdan Park. Outside of Kalemegdan, the oldest buildings date only from the 18th century, due to its geographic position and frequent wars and destructions. The oldest public structure in Belgrade is a nondescript Turkish türbe, while the oldest house is a modest clay house on Dorćol, from late 18th century. Western influence began in the 19th century, when the city completely transformed from an oriental town to the contemporary architecture of the time, with influences from neoclassicism, romanticism, and academic art. Serbian architects took over the development from the foreign builders in the late 19th century, producing the National Theatre, Old Palace, Cathedral Church and later, in the early 20th century, the National Assembly and National Museum, influenced by art nouveau. Elements of Neo-Byzantine architecture are present in buildings such as Vuk's Foundation, old Post Office in Kosovska street, and sacral architecture, such as St. Mark's Church (based on the Gračanica monastery), and the Temple of Saint Sava. In the socialist period, housing was built quickly and cheaply for the huge influx of people fleeing the countryside following World War II, sometimes resulting in the brutalist architecture of the blokovi ('blocks') of New Belgrade; a socrealism trend briefly ruled, resulting in buildings like the Trade Union Hall. However, in the mid-1950s, modernist trends took over, and still dominate the Belgrade architecture. Lying on the main artery connecting Europe and Asia, as well as, eventually, the Orient Express, Belgrade has been a popular place for travellers through the centuries. During Ottoman rule, as one of the largest cities of Turkey-in-Europe, various hans (English: khans) existed in the city: the Oriental variant of the roadside inn, they provided travellers with food, drink and resting facilities. One of the largest such resting places in Belgrade at the time was the Turski han (Turski han), located where the modern Faculty of Philosophy Plateau is. Other well known hans were the Paranos han (the modern Hotel Bristol), Davičo han, Batal-džamija han (House of the National Assembly of the Republic of Serbia), among others. However, the hans lacked comfort as the visitors mostly slept on the ground on mats they would bring themselves. They mostly provided shelter from the rain, but not always from the wind. Because of that, certain kafanas began adapting the floors above the dining areas into the rooms for the lodgers. Such kafanas soon changed their names to gostionica (inn) as Serbia Westernised. 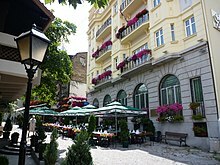 In 1843, on Dubrovačka Street (today Kralj Petar Street ), Serbia's knez Mihailo Obrenović built a large edifice which became the first hotel in Belgrade: Kod jelena ('at the deer's'), in the neighbourhood of Kosančićev Venac. Many criticised the move at the time due to the cost and the size of the building, and it soon became the gathering point of the Principality's wealthiest citizens. Colloquially, the building was also referred to as the staro zdanje, or the 'old edifice'. It remained a hotel until 1903 before being demolished in 1938. After the staro zdanje, numerous hotels were built in the second half of the 19th century: Nacional and Grand, also in Kosančićev Venac, Srpski Kralj, Srpska Kruna, Grčka Kraljica near Kalemegdan, Balkan and Pariz in Terazije, London, etc. As Belgrade became connected via steamboats and railway (after 1884), the number of visitors grew and new hotels were open with the ever luxurious commodities. In Savamala, the hotels Bosna and Bristol were opened. Other hotels included Solun and Orient, which was built near the Financial Park. Tourists which arrived by the Orient Express mostly stayed at the Petrograd Hotel in Wilson Square. Hotel Srpski Kralj, at the corner of Uzun Mirkova and Pariska Street was considered the best hotel in Belgrade during the Interbellum. It was destroyed during World War II. Elite neighbourhood of Dedinje is situated near the Topčider and Košutnjak parks. The Beli dvor (White Palace), house of royal family Karađorđević, is open for visitors. The palace has many valuable artworks. Nearby, Josip Broz Tito's mausoleum, called The House of Flowers, documents the life of the former Yugoslav president. Extreme sports are available, such as bungee jumping, water skiing, and paintballing. There are numerous tracks on the island, where it is possible to ride a bike, go for a walk, or go jogging. Apart from Ada, Belgrade has total of 16 islands on the rivers, many still unused. Among them, the Great War Island, at the confluence of Sava, stands out as an oasis of unshattered wildlife (especially birds). These areas, along with nearby Small War Island, are protected by the city's government as a nature preserve. There are 37 protected natural resources in the Belgrade urban area, among which eight are geo-heritage sites, i.e. Straževica profile, Mašin Majdan-Topčider, Profile at the Kalemegdan Fortress, Abandoned quarry in Barajevo, Karagača valley, Artesian well in Ovča, Kapela loess profile, and Lake in Sremčica. Other 29 places are biodiversity sites. As of 2018, there are three officially designated camp grounds in Belgrade. The oldest one is located in Batajnica, along the Batajnica Road. Named "Dunav", it is one of the most visited campsites in the country. Second one is situated within the complex of the ethno-household "Zornić's House" in the village of Baćevac, while the third is located in Ripanj, on the slopes of the Avala mountain. In 2017 some 15,000 overnights were recorded in camps. 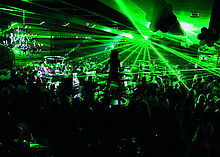 Belgrade has a reputation for vibrant nightlife; many clubs that are open until dawn can be found throughout the city. The most recognizable nightlife features of Belgrade are the barges (splav) spread along the banks of the Sava and Danube Rivers. Many weekend visitors—particularly from Bosnia and Herzegovina, Croatia and Slovenia—prefer Belgrade nightlife to that of their own capitals due to its perceived friendly atmosphere, plentiful clubs and bars, cheap drinks, lack of significant language barriers, and a lack of night life regulation. Famous alternative clubs in the city include Akademija and the KST (Klub Studenata Tehnike), located in the basement of the University of Belgrade Faculty of Electrical Engineering. One of the most famous sites for alternative cultural happenings in the city is the SKC (Student Cultural Centre), located right across from Belgrade's highrise landmark, the Belgrade Palace tower. Concerts featuring famous local and foreign bands are often held at the centre. SKC is also the site of various art exhibitions, as well as public debates and discussions. A more traditional Serbian nightlife experience, accompanied by traditional music known as Starogradska (roughly translated as Old Town Music), typical of northern Serbia's urban environments, is most prominent in Skadarlija, the city's old bohemian neighbourhood where the poets and artists of Belgrade gathered in the 19th and early 20th centuries. Skadar Street (the centre of Skadarlija) and the surrounding neighbourhood are lined with some of Belgrade's best and oldest traditional restaurants (called kafanas in Serbian), which date back to that period. At one end of the neighbourhood stands Belgrade's oldest beer brewery, founded in the first half of the 19th century. One of the city's oldest kafanas is the Znak pitanja ('?'). The Times reported that Europe's best nightlife can be found in Belgrade. In the Lonely Planet 1000 Ultimate Experiences guide of 2009, Belgrade was placed at the 1st spot among the top 10 party cities in the world. Serbian tennis player Novak Đoković was born in Belgrade. He is a 15-time Grand Slam champion. The Štark Arena has a capacity of 19,384. It is used for major sporting events and large concerts. In May 2008 it was the venue for the 53rd Eurovision Song Contest. The Aleksandar Nikolić Hall is the main venue of basketball clubs KK Partizan, European champion of 1992, and KK Crvena zvezda. Since 1996, semiannual (autumn/winter and spring/summer seasons) fashion weeks are held citywide. Numerous Serbian and foreign designers and fashion brands have their shows during Belgrade Fashion Week. The festival, which collaborates with London Fashion Week, has helped launch the international careers of local talents such as George Styler and Ana Ljubinković. British fashion designer Roksanda Ilincic, who was born in the city, also frequently presents her runway shows in Belgrade. In addition to fashion, there are two major design shows held in Belgrade every year which attract international architects and industrial designers such as Karim Rashid, Daniel Libeskind, Patricia Urquiola, and Konstantin Grcic. Both the Mikser Festival and Belgrade Design Week feature lectures, exhibits and competitions. Furthermore, international designers like Sacha Lakic, Ana Kraš, Bojana Sentaler, and Marek Djordjevic are originally from Belgrade. Belgrade is the most important media hub in Serbia. The city is home to the main headquarters of the national broadcaster Radio Television Serbia (RTS), which is a public service broadcaster. The most popular commercial broadcaster is RTV Pink, a Serbian media multinational, known for its popular entertainment programmes. One of the most popular commercial broadcaster is B92, another media company, which has its own TV station, radio station, and music and book publishing arms, as well as the most popular website on the Serbian internet. Other TV stations broadcasting from Belgrade include 1Prva (formerly Fox televizija), Nova, N1 and others which only cover the greater Belgrade municipal area, such as Studio B.
Belgrade has two state universities and several private institutions of higher education. The University of Belgrade, founded in 1808 as a grande école, is the oldest institution of higher learning in Serbia. Having developed with much of the rest of the city in the 19th century, several university buildings are recognised as forming a constituent part of Belgrade's architecture and cultural heritage. With enrolment numbers of nearly 90,000 students, the university is one of Europe's largest. The city is also home to 195 primary (elementary) schools and 85 secondary schools. The primary school system has 162 regular schools, 14 special schools, 15 art schools, and 4 adult schools, while the secondary school system has 51 vocational schools, 21 gymnasiums, 8 art schools and 5 special schools. The 230,000 pupils are managed by 22,000 employees in over 500 buildings, covering around 1.1 million square metres (12 million square feet). Belgrade has an extensive public transport system consisting of buses (118 urban lines and more than 300 suburban lines), trams (12 lines), trolleybuses (8 lines), S-train (2 lines) and BG Voz commuter rail (6 lines). Buses, trolleybuses and trams are run by GSP Beograd and SP Lasta in cooperation with private companies on some bus routes. The S-train network, BG Voz, run by city government in cooperation with Serbian Railways, is a part of the integrated transport system, and currently has two lines (Batajnica-Ovča and Belgrade-centre-Resnik). The BusPlus ticketing system based on contactless smart cards began operating in February 2012. Daily connections link the capital to other towns in Serbia and many other European destinations through the city's central bus station. Beovoz was the suburban/commuter railway network that provided mass-transit services in the city, similar to Paris's RER and Toronto's GO Transit. The main usage of system was to connect the suburbs with the city centre. Beovoz was operated by Serbian Railways. However, this system was abolished back in 2013, mostly due to introduction of more efficient BG Voz. Belgrade is one of the last big European capitals and cities with over a million people to have no metro or subway or other rapid transit system, though Belgrade Metro is in its planning stages. The main railway station is the main hub for international trains, while the new Belgrade Centre railway station is used as a terminus for most national intercity trains. The city is placed along the Pan-European corridors X and VII. The motorway system provides for easy access to Novi Sad and Budapest to the north, Niš to the south, and Zagreb to the west. Expressway is also toward Pančevo and new Expressway construction toward Obrenovac (Montenegro) is set scheduled for March 2017. Belgrade bypass is connecting the E70 and E75 motorways and it is currently under construction. Situated at the confluence of two major rivers, the Danube and the Sava, Belgrade has 11 bridges, the most important of which are Branko's bridge, the Ada Bridge, Pupin Bridge and the Gazela Bridge, the last two of which connect the core of the city to New Belgrade. In addition, an 'inner magistral semi-ring' is almost done and include a new Ada Bridge across the Sava river and a new Pupin Bridge across Danube river, which eased commuting within the city and unload the Gazela and Branko's bridge traffic. Belgrade has received various domestic and international honours, including the French Légion d'honneur (proclaimed 21 December 1920; Belgrade is one of four cities outside France, alongside Liège, Luxembourg and Volgograd, to receive this honour), the Czechoslovak War Cross (awarded 8 October 1925), the Yugoslavian Order of the Karađorđe's Star (awarded 18 May 1939) and the Yugoslavian Order of the People's Hero (proclaimed on 20 October 1974, the 30th anniversary of the overthrow of Nazi German occupation during World War II). All of these decorations were received for the war efforts during the World War I and World War II. In 2006, Financial Times' magazine Foreign Direct Investment awarded Belgrade the title of City of the Future of Southern Europe. ^ "Ancient Period". City of Belgrade. 5 October 2000. Retrieved 16 November 2010. ^ "Territory". City of Belgrade. Retrieved 6 May 2009. ^ "Geographical position". City of Belgrade. Retrieved 10 July 2007. ^ a b c "Regions in Republic of Serbia, 2018" (PDF). publikacije.stat.gov.rs. Retrieved 14 November 2018. ^ a b "Why invest in Belgrade?". City of Belgrade. Retrieved 11 October 2010. ^ a b c "Discover Belgrade". City of Belgrade. Archived from the original on 18 May 2009. Retrieved 5 May 2009. ^ a b Rich, John (1992). The City in Late Antiquity. CRC Press. p. 113. ISBN 978-0-203-13016-2. ^ "The History of Belgrade". BelgradeNet Travel Guide. Retrieved 5 May 2009. ^ Nurden, Robert (22 March 2009). "Belgrade has risen from the ashes to become the Balkans' party city". London: Independent. Archived from the original on 26 March 2009. Retrieved 5 May 2009. ^ a b "Assembly of the City of Belgrade". City of Belgrade. Retrieved 10 July 2007. ^ a b c "Urban Municipalities". Official website. Retrieved 10 July 2007. ^ "The World According to GAWC 2012". GAWC. Retrieved 10 January 2015. ^ Saric, J. (2008). "Paleolithic and mesolithic finds from profile of the Zemun loess". Starinar (58): 9–9. doi:10.2298/STA0858009S. ^ Chapman, John (2000). Fragmentation in Archaeology: People, Places, and Broken Objects. London: Routledge. p. 236. ISBN 978-0-415-15803-9. ^ Chapman, John (1981). The Vinča culture of south-east Europe: Studies in chronology, economy and society (2 vols). BAR International Series. 117. Oxford: BAR. ISBN 0-86054-139-8. ^ Radivojević, M.; Rehren, T.; Pernicka, E.; Šljivar, D. A.; Brauns, M.; Borić, D. A. (2010). "On the origins of extractive metallurgy: New evidence from Europe". Journal of Archaeological Science. 37 (11): 2775. doi:10.1016/j.jas.2010.06.012. ^ Haarmann, Harald (2002). Geschichte der Schrift (in German). C.H. Beck. p. 20. ISBN 978-3-406-47998-4. ^ Radivoje Mikić, ed. (2006). Српска породична енциклопедија, књига 3, Ба-Би [Serbian family encynclopedia, Vol. 3, Ba-Bi]. Narodna Knjiga, Politika. p. 116. ISBN 86-331-2732-6. ^ Belgrade A Cultural History. Oxford University Press. 29 October 2008. ISBN 9780199704521. Retrieved 16 January 2016. ^ "Jason and the Argonauts sail again". The Telegraph. Retrieved 16 January 2016. ^ "Belgrade Fortress history". Public Enterprise "Belgrade Fortress". Archived from the original on 5 September 2011. Retrieved 18 January 2011. ^ "Constantine I – Britannica Online Encyclopedia". Britannica.com. Archived from the original on 18 June 2008. Retrieved 7 July 2009. ^ "Philologic Results-". Artfl.uchicago.edu. Archived from the original on 13 August 2007. Retrieved 7 July 2009. ^ "History (Ancient Period)". Official website. Retrieved 10 July 2007. ^ "City of Belgrade – Ancient Period". Beograd.rs. 5 October 2000. Retrieved 7 July 2009. ^ Gerard Friell; Stephen Williams (1999). The Rome that Did Not Fall: The Survival of the East in the Fifth Century. Psychology Press. p. 67. ISBN 978-0-415-15403-1. ^ Roy E. H. Mellor (1975). 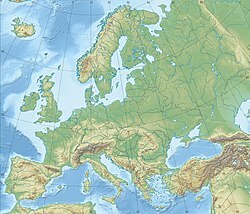 Eastern Europe: a geography of the Comecon countries. Macmillan. p. 43. ^ Bury, J. B. (2009) . History of the Later Roman Empire from Arcadius to Irene Vol. II. New York: Cosimo Classics. p. 117. ISBN 978-1-60520-405-5. ^ Bohlau, 1964, Slavistische Forschungen, Volume 6, p. 103. University of California. ^ A Concise History of Bulgaria, R. J. Crampton, Edition 2, revised, Cambridge University Press, 2005, ISBN 1139448234, p. 10. ^ Земя на световен кръстопът, Борис Стоев Чолпанов, Изд. на Българската академия на науките, 1993, стр. 39. ^ "LIBI, t. II (1960) (2_151.jpg)". promacedonia.org. ^ "The History of Belgrade". Belgradenet.com. Retrieved 16 November 2010. ^ a b c d "How to Conquer Belgrade – History". Beligrad.com. 16 December 1934. Archived from the original on 16 June 2009. Retrieved 7 July 2009. ^ "The History of Belgrade". Belgradenet.com. Archived from the original on 28 June 2009. Retrieved 7 July 2009. ^ a b "History (Medieval Serbian Belgrade)". Official website. Retrieved 10 July 2007. ^ "Battle of Maritsa". Encyclopædia Britannica. Archived from the original on 14 June 2007. Retrieved 10 July 2007. ^ "Battle of Kosovo". Encyclopædia Britannica. Archived from the original on 26 June 2007. Retrieved 10 July 2007. ^ Ćorović, Vladimir (1997). "V. Despot Đurađ Branković". Istorija srpskog naroda (in Serbian). Banja Luka / Belgrade: Project Rastko. ISBN 86-7119-101-X. Archived from the original on 19 March 2013. Retrieved 17 July 2007. ^ a b "The History of Belgrade". Belgradenet.com. Retrieved 7 July 2009. ^ Kovach, Tom R. "Ottoman-Hungarian Wars: Siege of Belgrade in 1456". Military History magazine. Archived from the original on 26 June 2007. Retrieved 10 July 2007. ^ "Hungary: A Brief History". Mek.oszk.hu. Retrieved 16 November 2010. ^ "The Rough Guide to Turkey: Belgrade Forest". Rough Guides. Archived from the original on 9 September 2012. Retrieved 5 May 2009. ^ a b "History (Turkish and Austrian Rule)". Official website. Retrieved 10 July 2007. ^ Aleksov, Bojan (December 2003). "Nationalism In Construction: The Memorial Church of St. Sava on Vračar Hill In Belgrade". Balkanologie. VII (47): 52–53. Retrieved 15 September 2010. ^ "Belgrade Fortress: History". Razgledanje.tripod.com. 23 August 2004. Retrieved 7 July 2009. ^ Medaković, Dejan (1990). "Tajne poruke svetog Save" Svetosavska crkva i velika seoba Srba 1690. godine". Oči u oči. Belgrade: BIGZ (online reprint by Serbian Unity Congress library). ISBN 978-86-13-00903-0. Archived from the original on 23 October 2007. Retrieved 17 May 2007. ^ Mišković, Nataša (2008). Basare und Boulevards: Belgrad im 19. Jahrhundert. Vienna. p. 16. ^ a b "History (Liberation of Belgrade)". Official website. Retrieved 10 July 2007. ^ Pavkovic, Aleksandar (19 October 2001). "Nations into States: National Liberations in Former Yugoslavia". The Australian National University. ^ "History". City of Kragujevac official website. Archived from the original on 29 March 2010. Retrieved 15 September 2010. ^ "History (Important Years Through City History)". Official website. Retrieved 10 July 2007. ^ Radović, Srđan (2014). Beogradski odonimi. Belgrade. pp. 47–48. ^ Stanford J. Shaw and Ezel Kural Shaw, History of the Ottoman Empire and Modern Turkey, Volume 2: Reform, Revolution and Republic—The Rise of Modern Turkey, 1808–1975 (Cambridge University Press, 1977), p. 148. ^ a b "History (The Capital of Serbia and Yugoslavia)". Official website. Retrieved 10 July 2007. ^ Lahmeyer, Jan (3 February 2003). "The Yugoslav Federation: Historical demographical data of the urban centers". www.populstat.info. Retrieved 17 May 2007. ^ Herbermann, Charles, ed. (1913). "Belgrade and Smederevo" . Catholic Encyclopedia. New York: Robert Appleton Company. ^ Kosanovic, Dejan (1995). "Serbian Film and Cinematography (1896–1993)". The history of Serbian Culture. Porthill Publishers. ISBN 1-870732-31-6. Archived from the original on 19 March 2013. Retrieved 10 July 2007. ^ "Serbia :: Vojvodina". Balkanology. Retrieved 7 July 2009. ^ ISBN 86-17-09287-4: Kosta Nikolić, Nikola Žutić, Momčilo Pavlović, Zorica Špadijer: Историја за трећи разред гимназије, Belgrade, 2002, p. 144. ^ Petrović, Dragan; Arold, R (2001). "Industrija i urbani razvoj Beograda". Industrija. 21 (1–4): 87–94. ISSN 0350-0373. 0350-03730101087P. Archived from the original (PDF) on 17 December 2008. Retrieved 10 July 2007. ^ "Twentieth Century – Innovations in Belgrade". Serbia-info.com (Government of Serbia website). Archived from the original on 18 January 2008. Retrieved 21 July 2007. ^ "DA NIJE BILO 6. APRILA Najlepše srušene zgrade Beograda". 25 November 2015. ^ Aslani, Samir (1 June 2004). "Lovački avioni Drugog svetskog rata". Samir Aslani – via Google Books. ^ Stevenson, William (1976). A Man Called Intrepid, The Secret War. New York: Ballantine Books. p. 230. ISBN 0-345-27254-4. ^ "Part Two the Yugoslav Campaign". The German campaign in the Balkans (Spring 1941). United States Army Center of Military History. 1986 . CMH Pub 104-4. Archived from the original on 19 June 2009. Retrieved 7 July 2009. ^ "Axis Invasion of Yugoslavia". Holocaust Encyclopedia. United States Holocaust Memorial Museum. Retrieved 19 April 2016. ^ Rubenstein, Richard L; Roth, John King (2003). Approaches to Auschwitz: The Holocaust and Its Legacy. Westminster John Knox Press. p. 170. ISBN 0-664-22353-2. Archived from the original on 13 October 2008. ^ Zbornik dokumenata vojnoistorijskog instituta: TOM XIV, Knjiga 1, znaci.net; accessed 15 March 2016. ^ "Anniversary of the Allied Bomb Attacks Against Belgrade". Radio-Television of Serbia. 17 April 2008. Retrieved 5 May 2009. ^ "Tekstovi (Texts)". Napredniklub.org. Archived from the original on 27 July 2011. Retrieved 16 November 2010. ^ "Izmedju Srpa i Cekica (Between the hammer and sickle)". Scribd.com. 20 April 2009. Archived from the original on 30 May 2010. Retrieved 16 November 2010. ^ Graff, James L. (25 March 1991). "Yugoslavia: Mass bedlam in Belgrade". TIME. Retrieved 10 July 2007. ^ "Srbija na mitinzima (1990–1999)" (in Serbian). Vreme. 21 August 1999. Archived from the original on 19 June 2007. Retrieved 10 July 2007. ^ "History (Disintegration Years 1988–2000)". Official website. Retrieved 10 July 2007. ^ Perlez, Jane (23 February 1997). "New Mayor of Belgrade: A Serbian Chameleon". The New York Times. Retrieved 17 May 2007. ^ "NATO bombing". Official website. Retrieved 17 May 2007. ^ "Parties, citizens mark October 5". B92. 5 October 2007. Archived from the original on 18 April 2009. Retrieved 7 May 2009. ^ "October 5, 2000". City of Belgrade. Retrieved 7 May 2009. ^ "Ovako će izgledati "Beograd na vodi"". Blic.rs. 19 January 2014. Archived from the original on 22 February 2014. ^ "A Look at Abu Dhabi's 'Bad Joke': The Belgrade Waterfront Project". ^ "Natural Features". City of Belgrade (official website). Retrieved 12 December 2012. ^ "Record-breaking heat measured in Belgrade". Monsters and Critics. Deutsche Presse-Agentur. 24 July 2007. Archived from the original on 14 July 2012. Retrieved 10 August 2007. ^ "Climate". City of Belgrade (official website). Retrieved 10 July 2007. ^ "Monthly and annual means, maximum and minimum values of meteorological elements for the period 1981 – 2010-Belgrade" (in Serbian). Hydrometeorological Service of Serbia. Retrieved 10 October 2018. ^ "Assembly of the City of Belgrade". Official site. Retrieved 4 November 2013. ^ "City Council". Official site. Retrieved 4 November 2013. ^ "City Administration". Official site. Retrieved 4 November 2013. ^ a b Belgradenet.com. "The History of Belgrade: Middle Ages – Turkish Conquest – Liberation of Belgrade". www.belgradenet.com. ^ a b c d e f g h "The YUGOSLAV FEDERATION : urban population". www.populstat.info. ^ Refugee Serbs Assail Belgrade Government: The Washington Post, Tuesday, 22 June 1999. ^ "Stranci tanje budžet". Novosti.rs. Retrieved 16 November 2010. ^ "Kinezi Marko, Miloš i Ana" (in Serbian). Kurir. 20 February 2005. Archived from the original on 12 February 2009. Retrieved 18 July 2007. ^ Vasić, Biljana (15 January 2001). "Kineska četvrt u bloku 70" (in Serbian). Vreme. Archived from the original on 15 July 2007. Retrieved 18 July 2007. ^ Zimonjic, Vesna Peric (7 December 2005). "A unique friendship club in Belgrade". Dawn – International. Archived from the original on 27 September 2007. Retrieved 17 July 2007. ^ "Lokale neće ni džabe". novosti.rs. ^ a b "U Beogradu radi 120.000 firmi". Večernje Novosti. 23 April 2013. Retrieved 4 November 2013. ^ Serbia, RTS, Radio televizija Srbije, Radio Television of. "Mali: Nikad bolji privredni ambijent u Beogradu". ^ "Privredna komora Beograda". Docstoc.com. 4 October 2011. Retrieved 12 March 2013. ^ "Tržni centri zatvorili lokale". Retrieved 14 August 2016. ^ "Privreda Beograda" (in Serbian). Economic Chamber of Belgrade. Retrieved 19 January 2010. ^ "Microsoft Development Center Serbia". Microsoft.com. 1 April 2011. Retrieved 15 May 2013. ^ "Asus otvorio regionalni centar u Beogradu". Emportal.rs. Archived from the original on 22 May 2011. Retrieved 16 November 2010. ^ "Centar kompanije 'Intel' za Balkan u Beogradu – Srbija deo 'Intel World Ahead Program'". E kapija. Retrieved 7 July 2009. ^ Beograd, Ana Vlahović, (25 September 2011). "Srbija centar IT industrije". Pressonline.rs. Retrieved 12 March 2013. ^ "Regional GDP in the Republic of Serbia" (in Serbian). Statistics office of the Republic of Serbia. October 2014. Retrieved 4 November 2014. ^ "Culture and Art (Cultural Events)". Official website. Retrieved 10 July 2007. ^ "The biography of Ivo Andrić". The Ivo Andrić Foundation. Archived from the original on 7 September 2009. Retrieved 18 May 2007. ^ "Borislav Pekić – Biografija" (in Serbian). Project Rastko. Archived from the original on 16 January 2009. Retrieved 19 May 2007. ^ Tabbi, Joseph (26 July 2005). "Miloš Crnjanski and his descendents". Electronic Book Review. Archived from the original on 11 July 2007. Retrieved 10 July 2007. ^ "Meša Selimović – Biografija" (in Bosnian). Kitabhana.net. Archived from the original on 16 July 2007. Retrieved 10 July 2007. ^ "Beogradska rock scena je otišla u ilegalu" (in Serbian). Glas.ba. Retrieved 18 January 2011. ^ Shepherd, John (2005). Continuum encyclopedia of popular music of the world. 3–7. Continuum. p. 142. ISBN 978-0-8264-7436-0. ^ Pavlić, Aleksandar (9 February 2005). "Beogradski Sindikat: Svi Zajedno" (in Serbian). Popboks magazine. Archived from the original on 13 May 2007. Retrieved 23 May 2007. ^ Todorović, S. S. (30 January 2004). "Liričar među reperima" (in Serbian). Balkanmedia. Archived from the original on 17 January 2010. Retrieved 23 May 2007. ^ "National Theatre Belgrade – Opera". Narodnopozoriste.rs. 1 May 2013. Retrieved 15 May 2013. ^ "About Madlenianum". Madlenianum.rs. Archived from the original on 15 May 2013. Retrieved 15 May 2013. ^ "El Instituto Cervantes de Belgrado". Belgrado.cervantes.es. Retrieved 15 May 2013. ^ "Goethe-Institut Belgrad – Über uns". Goethe.de. Retrieved 15 May 2013. ^ Konstantinovic, Jasmina. "Institut français de Serbie – Qui sommes-nous ?". Institutfrancais.rs. Archived from the original on 21 June 2013. Retrieved 15 May 2013. ^ American Corners In Serbia (16 May 2003). "ac beograd – american corners in serbia". Americancorners-sam.net. Archived from the original on 21 May 2013. Retrieved 15 May 2013. ^ "Das Kulturforum Belgrad". Bmeia.gv.at. Archived from the original on 14 January 2013. Retrieved 15 May 2013. ^ "British Council Serbia". Britishcouncil.org. 3 March 2012. Archived from the original on 5 April 2013. Retrieved 15 May 2013. ^ "Confucius Institute in Belgrade". Konfucije.fil.bg.ac.rs. Archived from the original on 5 June 2013. Retrieved 15 May 2013. ^ "City of Belgrade Cultural Centers and Organizations". Beograd.rs. Retrieved 15 May 2013. ^ "Hellenic Foundation for Culture – Belgrade Branch". HFC Belgrade. Archived from the original on 29 August 2014. Retrieved 15 May 2013. ^ "Istituto Italiano di Cultura di Belgrado". Iicbelgrado.esteri.it. Retrieved 15 May 2013. ^ "Azerbejdžanski kulturni centar". Azerbejdzan.rs. Retrieved 15 May 2013. ^ "О Русском Доме – Русский Дом в Белграде". Ruskidom.rs. Archived from the original on 11 May 2013. Retrieved 15 May 2013. ^ "EUNIC cluster in Belgrade". Eunic-online.eu. Archived from the original on 6 February 2013. Retrieved 15 May 2013. ^ "Serbian ballad wins Eurovision Song Contest – Belgrade hosts in 2008". Helsingin Sanomat. 14 May 2007. Archived from the original on 30 August 2007. Retrieved 10 July 2007. ^ Cvjetićanin, Tatjana. "From the history of the National Museum in Belgrade". National Museum of Serbia. Archived from the original on 14 August 2011. Retrieved 27 July 2007. ^ "Museums 3". Official website. Retrieved 10 July 2007. ^ "About the Museum". eng.msub.org.rs. Retrieved 30 March 2019. ^ "Art gathers dust as Serbia museums kept shut". BBC News. 27 August 2013. ^ "Military Museum". Lonely Planet. Retrieved 18 January 2010. ^ "Military Museum | About Us". www.muzej.mod.gov.rs. Retrieved 30 March 2019. ^ "Lična karta Muzeja ratnog vazduhoplovstva" (in Serbian). Museum of Air force Belgrade. Archived from the original on 28 May 2006. Retrieved 19 May 2007. ^ "About the museum". Nikola Tesla Museum. Archived from the original on 10 June 2007. Retrieved 10 July 2007. ^ "City of Belgrade – Museums 1". Official website. Retrieved 10 July 2007. ^ "Cultural institutions: Museum of African Art". Official website. Retrieved 10 July 2007. ^ "Action programme 2006 for Serbia: Support to the Yugoslav Film Archive" (PDF). European Agency for Reconstruction. 1 January 2006. Archived from the original (PDF) on 2 August 2007. Retrieved 10 July 2007. ^ "New Depository for the Yugoslav Film Archive's treasure". SEECult.org, Culture Portal of Southeastern Europe. 7 June 2007. Archived from the original on 11 October 2007. Retrieved 10 July 2007. ^ "U Noći muzeja 60 kulturnih institucija". novosti.rs. ^ "Najbolje, u Muzeju 25. maj – SEEcult.org Portal za kulturu jugoistočne Evrope". seecult.org. ^ "Политика Online – Од Стаљина сабља, а од астронаута каменчићи с Месеца". Politika Online. ^ Comrie, Nicholas; Moore, Lucy (1 October 2007). "Zemun: The Town Within the City". B92 Travel. Retrieved 17 May 2007. ^ a b c d e Manević, Zoran. "Architecture and Building". MIT website. Archived from the original on 11 August 2007. Retrieved 19 May 2007. ^ Mitrović, Prof. Dr. Mihajlo (27 June 2003). "Seventh Belgrade triennial of world architecture". ULUS. Archived from the original on 17 January 2010. Retrieved 19 May 2007. ^ "Potrebno uložiti 1,6 milijardi evra u energetsku efikasnost". Blic. 10 December 2014. ^ a b c Dragan Perić (2 September 2018). "Kada su svi putevi vodili u Beograd" [When all roads were leading to Belgrade]. Politika-Magazin, No. 1092 (in Serbian). pp. 28–29. ^ Dejan Aleksić (25 January 2018). ""Čitanka" srpske istorije i kulture" [Reading book of Serbian history and culture]. Politika (in Serbian). p. 17. ^ Dejan Aleksić (7–8 April 2018). "Razglednica koje više nema" [Postcards that is no more]. Politika (in Serbian). p. 22. ^ Wolfs, Laura (21 June 2010). "A Palacial Tour". Balkan Insight. Archived from the original on 7 July 2011. Retrieved 18 September 2011. ^ a b c "Ada Ciganlija". Tourist Organization of Belgrade. Retrieved 15 September 2010. ^ "Ada: Too Early for Swimming". Livinginbelgrade.com. Archived from the original on 8 August 2012. ^ a b "Sport Activities in Belgrade". Archived from the original on 15 January 2013. ^ Nikolov, Ana (29 July 2005). "Beograd – grad na rekama". Institut za Arhitekturu i Urbanizam Srbije. Archived from the original on 28 June 2007. Retrieved 5 June 2007. ^ "Zbogom, oazo!" (in Serbian). Kurir. 23 May 2006. Archived from the original on 20 October 2010. Retrieved 5 June 2007. ^ Beoinfo (4 August 2005). "Prirodno dobro "Veliko ratno ostrvo" stavljeno pod zaštitu Skupštine grada" (in Serbian). Ekoforum. Archived from the original on 26 July 2011. Retrieved 5 June 2007. ^ Petrović, Marko; Lukić, Dobrila; Radovanović, Milan; Vujko, Aleksandra; Gajić, Tamara; Vuković, Darko (5 October 2017). ""Urban geosites" as an alternative geotourism destination – evidence from Belgrade". Open Geosciences. 9 (1): 442–456. doi:10.1515/geo-2017-0034. ISSN 2391-5447. ^ "Beogradu od turizma gotovo pola milijarde evra". Rs.seebiz.eu. Retrieved 12 March 2013. ^ a b c "Vesti online / Slobodno Vreme / Putovanja / Nikad više turista: Beograd najviše vole Turci i Hrvati". www.vesti-online.com. ^ Ana Vuković (16 August 2018). "Kamping turizam – neiskorišćena šansa" [Camping tourism – unused chance]. Politika (in Serbian). p. 14. ^ Prentice, Eve-Ann (10 August 2003). "Why I love battereBelgrade". The Guardian Travel. London. Archived from the original on 15 May 2007. Retrieved 19 May 2007. ^ Sherwood, Seth (16 October 2005). "Belgrade Rocks". The New York Times. Retrieved 19 May 2007. ^ Gruber, Barbara (22 August 2006). "Belgrade's Nightlife Floats on the Danube". Deutsche Welle. Archived from the original on 16 June 2007. Retrieved 19 May 2007. ^ "Slovenci dolaze u jeftin provod" (in Serbian). Glas Javnosti. 21 December 2004. Retrieved 10 July 2007. ^ "U Beograd na vikend-zabavu" (in Croatian). Večernji list. 6 January 2006. Archived from the original on 6 January 2006. Retrieved 15 June 2007. ^ Gordy, Eric D. (1999). "The Destruction of Musical Alternatives". The Culture of Power in Serbia: Nationalism and the Destruction of Alternatives. Penn State Press. pp. 121–122. ISBN 0-271-01958-1. Retrieved 10 July 2007. ^ "Intro". Club "Akademija". Retrieved 10 July 2007. ^ "Klub Studenata Tehnike – O nama" (in Serbian). ^ Galić, David (22 February 2010). "Studentski Kulturni Centar". Balkan Insight. Retrieved 19 January 2011. ^ "Skadarlija". Tourist Organisation of Belgrade. Archived from the original on 20 December 2010. Retrieved 19 January 2011. ^ "Beogradska Industrija Piva AD". SEE News. Archived from the original on 26 April 2009. Retrieved 5 May 2009. ^ "Znamenite građevine 3" (in Serbian). Official site. Retrieved 10 July 2007. ^ Scurlock, Gareth (4 November 2008). "Europe's best nightlife". London: Official site. Retrieved 11 April 2008. ^ "The world's top 10 party towns". The Sydney Morning Herald. 9 November 2009. Archived from the original on 10 April 2010. Retrieved 16 March 2010. ^ "Sport and Recreation". Official website. Retrieved 10 July 2007. ^ "Universiade 2009 (Belgrade)". FISU. Archived from the original on 9 February 2008. Retrieved 19 May 2007. ^ "Sport and Recreation (Stadiums)". Official website. Retrieved 10 July 2007. ^ Fortune, Matt (27 November 2009). "THE LIST: The greatest rivalries in club football, Nos 10–1". London: Dailymail.co.uk. Retrieved 15 May 2013. ^ "О Штарк Арени" [About Štark Arena]. Štark Arena. Retrieved 5 August 2018. ^ "Belgrade Arena Profile". Belgrade Arena. Archived from the original on 8 June 2012. Retrieved 28 May 2012. ^ "Sport and Recreation (Sport Centers and Halls)". Official website. Retrieved 10 July 2007. ^ "Venues". EYOF Belgrade 2007. Archived from the original on 8 October 2007. Retrieved 30 July 2007. ^ "Tipsarevic sends Serbia into first Davis Cup final". Davis Cup official website. 19 September 2010. Retrieved 20 September 2010. ^ "O nama" (in Serbian). Belgrade Fashion Week. Archived from the original on 7 November 2011. ^ "Medijski javni servis građana" (in Serbian). Radio Television of Serbia. 13 November 2008. Archived from the original on 20 May 2011. ^ Manasek, Jared (January 2005). "The Paradox of Pink". Columbia Journalism Review. Archived from the original on 10 March 2007. Retrieved 19 May 2007. ^ "B92 na 8.598. mestu na svetu" (in Serbian). B92. 1 September 2006. Retrieved 19 May 2007. ^ "The University of Belgrade – The Seedbed of University Education". Faculty of Law of University of Belgrade. Retrieved 18 May 2007. ^ "Word by the Rector". University of Belgrade. Archived from the original on 6 October 2010. Retrieved 19 January 2011. ^ "Education and Science". City of Belgrade. Retrieved 10 July 2007. ^ "Statistics". Public Transport Company "Belgrade". Archived from the original on 10 May 2009. Retrieved 19 May 2007. ^ Administrator. "Bg Voz". www.expatserbia.com. Archived from the original on 5 September 2013. Retrieved 19 December 2017. ^ "Železnice Srbije – Red voznje za Beovoz i BG:VOZ". Serbian railways. Archived from the original on 10 October 2010. ^ "Belgrade Bypass, Serbia". CEE Bankwatch network. Archived from the original on 11 October 2007. Retrieved 19 May 2007. ^ "1. faza prve deonice Unutrašnjeg magistralnog poluprstena" (PDF) (in Serbian). Belgrade Direction for Building and Real Estate Land/EBRD. 1 July 2005. Archived from the original (PDF) on 9 August 2007. Retrieved 15 September 2007. ^ "Luka Beograd AS – Istorijat" [History of the Port of Belgrade] (in Serbian). Port of Belgrade. Retrieved 11 October 2010. ^ "Aerodrom Nikola Tesla | News". Beg.aero. Archived from the original on 12 May 2013. Retrieved 12 March 2013. ^ "Belgrade Nikola Tesla Airport among fastest growing in Europe". 13 August 2013. Archived from the original on 6 March 2016. Retrieved 6 August 2016. ^ a b "International Cooperation" (official website). City of Belgrad. Retrieved 16 June 2015. ^ Griffin, Mary (2 August 2011). "Coventry's twin towns". Coventry Telegraph. Archived from the original on 6 August 2013. Retrieved 6 August 2013. ^ "Coventry – Twin towns and cities". Coventry City Council. Archived from the original on 12 April 2013. Retrieved 6 August 2013. ^ "Gradonačelnici Beograda i Ljubljane potpisali sporazum o bratimljenju dva glavna grada". Beograd.rs. Retrieved 15 May 2013. ^ "Potpisan sporazum o bratimljenju Beorgada i Šangaja". b92.net (in Serbian). Tanjug. 21 May 2018. Retrieved 21 May 2018. ^ "Kazakhstan, Serbia agree to cooperate on air communication". AKIpress. Retrieved 16 November 2016. ^ "Tehran, Belgrade sign agreement to boost ties". Tehran Municipality. Retrieved 6 October 2016. ^ "Saradnja Beograda i Šendžena". B92. Retrieved 11 July 2009. ^ Градови партнери [City of Banja Luka – Partner cities]. Administrative Office of the City of Banja Luka (in Serbian). Archived from the original on 17 September 2011. Retrieved 9 August 2013. ^ "Received Decorations". Official website. Retrieved 16 May 2007. ^ "Beograd – grad heroj". RTV Pink. 6 November 2009. Archived from the original on 15 July 2011. Retrieved 15 November 2009. ^ "European Cities of the Future 2006/07". fDi magazine. 6 February 2006. Archived from the original on 27 September 2007. Retrieved 10 July 2007. ^ Miloradović, Aleksandar (1 September 2006). "Belgrade – City of the Future in Southern Europe" (PDF). TheRegion, magazine of SEE Europe. Archived from the original (PDF) on 8 August 2007. Retrieved 10 July 2007. Paton, Andrew Archibald (4 November 2005) . Servia, Youngest Member of the European Family: or, A Residence in Belgrade, and Travels in the Highlands and Woodlands of the Interior, during the years 1843 and 1844 (Project Gutenberg reprint ed.). London: Longman, Brown, Green and Longmans. Retrieved 22 July 2009. 1 Kosovo is the subject of a territorial dispute between the Republic of Kosovo and the Republic of Serbia. The Republic of Kosovo unilaterally declared independence on 17 February 2008, but Serbia continues to claim it as part of its own sovereign territory. The two governments began to normalise relations in 2013, as part of the Brussels Agreement. Kosovo has been recognized as an independent state by 112 out of 193 United Nations member states. 10 states have recognized Kosovo only to later withdraw their recognition. This page was last edited on 21 April 2019, at 19:01 (UTC).